Zürich, Braginsky Collection, B115: Sefer Mitzvot Katan (Das kleine Buch der Gebote) (http://www.e-codices.ch/de/list/one/bc/b-0115). Isaac of Corbeil (d. 1280), also known as Ba’al ha-Hotem, perhaps because of his prominent nose, authored the Sefer Mitzvot Katan (SeMaK), the Small Book of Commandments. He divided the 613 positive and negative biblical commandments, and a few additional rabbinic ones, into seven daily sections to be read sequentially and completed once a week. Rabbinic leaders in France instructed students to copy the work into their prayer books and recite the daily reading of the commandments instead of supplications or the book of Psalms. 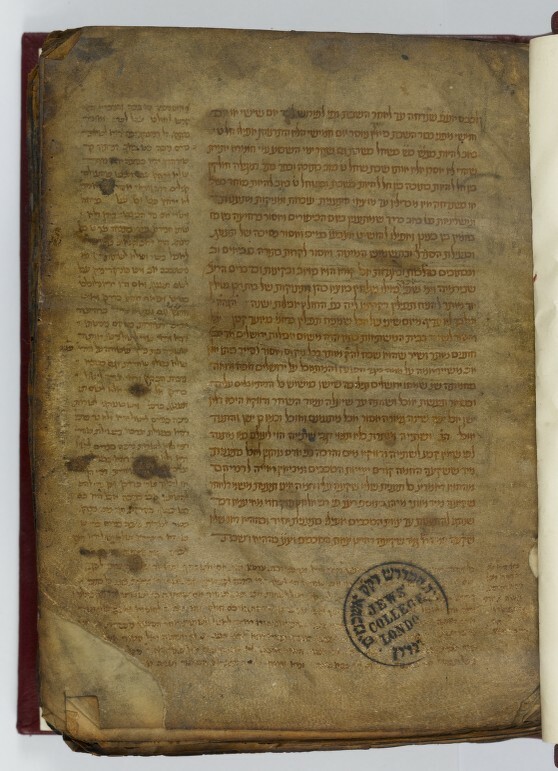 The SeMaK quickly reached Germany where it was recognized as an authoritative halakhic work. Often comments and glosses in the form of rectangular shaped “windows” were added in the margins or in the text itself producing aesthetically pleasing and imaginative page layouts. By not identifying the source of these glosses, scribes frequently created difficulties in determining authorship of the commentaries. 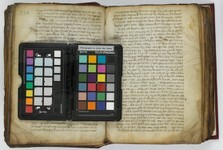 The three manuscripts discussed here exemplify the complex diffusion of the SeMaK. The latest (BC 115) contains the glosses of Moses of Zurich, who lived in Zurich in the middle of the fourteenth century. There is disagreement whether he and his students died in the pogroms following the Black Death or if he escaped to Bern. Manuscripts containing Moses’ glosses are called the Zürcher. The other two manuscripts (BC 240 and 182) originally formed one volume. Their scribe, Moses Winik, whose name is derived from Windecken, near Frankfurt am Main, lived in Cologne in the 1390s. Later he moved to Treviso, Italy, where he died in 1411. His tombstone indicates he was the head of a yeshiva. He corresponded with rabbinic contemporaries and engaged in mystical studies. A charm for the healing of burns is attributed to him. Moses Winik copied the SeMaK and a prayer book together, as was customary. He also added a commentary, referred to as Gournish. Although several rabbinic works with this name are known, its etymology is undetermined. A Journey through Jewish Worlds. Highlights from the Braginsky collection of Hebrew manuscripts and printed books, hrsg. E. M. Cohen, S. L. Mintz, E. G. L. Schrijver, Amsterdam, 2009, p. 46. Isaak von Corbeil (gestorben 1280), möglicherweise wegen einer auffallenden Nase Ba’al ha-chotem («Herr Nase») genannt, ist der Autor des halachischen Werks Sefer mizwot katan (SeMaK). Die in Frankreich entstandene Kurzfassung der 613 biblischen Gebote fand auch in Deutschland bald Anerkennung und galt da in der Folge als massgebliches religionsgesetzliches Werk. Kommentare und Glossen wurden in den Handschriften des Sefer mizwot katan häufig als ästhetisch ansprechende und kalligrafisch phantasievolle Schriftbilder gestaltet. Da die Schreiber die Quellen dieser Zusätze nicht benannten, bleibt deren Autorschaft vielfach im Dunkeln. Für die weite Verbreitung des Werks in Deutschland finden sich in der Braginsky Collection gleich drei Beispiele. Hier wird das jüngste gezeigt, versehen mit den Glossen von Moses von Zürich (Mitte des 14. Jahrhunderts). Handschriften mit Moses’ Glossen nennt die Fachwelt «Zürcher». Ob er und seine Schüler in den Pestpogromen von 1348/49 umgekommen sind oder nach Bern fliehen konnten, ist in der Forschung umstritten. Schöne Seiten. Jüdische Schriftkultur aus der Braginsky Collection, Hrsg. von Emile Schrijver und Falk Wiesemann, Zürich 2011, S. 64. A Journey through Jewish Worlds. Highlights from the Braginsky collection of Hebrew manuscripts and printed books, hrsg. E. M. Cohen, S. L. Mintz, E. G. L. Schrijver, Amsterdam, 2009, p. 46-47. Schöne Seiten. Jüdische Schriftkultur aus der Braginsky Collection, Hrsg. von Emile Schrijver und Falk Wiesemann, Zürich 2011, S. 64-65.